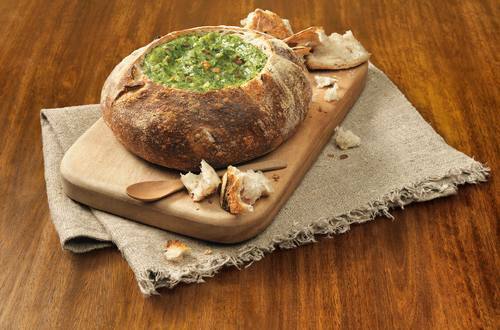 A delicious spinach dip in its own edible bowl; enjoy as an appetiser at your next party. Serves 8 in under half an hour. 1 Preheat oven to 180°C. Defrost spinach and leave to one side to drain well. Fry onion in oil for 1 minute, add flour, soup mix and milk; whisk continuously until mixture boils. Stir in defrosted spinach, bring to boil. 2 Cut a hole in the top of the loaf, about the size of a small side plate. Pull out middle of bread in chunks and cut the centre piece into chunks. Place bread on a flat baking tray and bake for 10 minutes. Pour spinach sauce into loaf and serve with pieces of bread around the edge for dipping.